Azuay is located in the southern part of La Sierra and it is where the city of Cuenca is located. Due to the beautiful location in the mountains and the mild, year round weather, Cuenca has quickly become one of Ecuador’s top spots to visit. It’s also the home of the Cajas National Park. Even though it’s the smallest province in Ecuador, Bolivar makes it up in beauty. Being in the heart of the Andes, you can expect to see spectacular views from the mountains. Cañar is best known for Ingapirca, the ancient Inca ruins located in this province. If history is not your thing, you will still enjoy the many rivers, rolling mountains and views this province has to offer. Carchi is located on the border of Ecuador and Colombia. The major attraction in Carchi is Gruta de la Paz, an underground cave. Here you will find some amazing finds beneath your feet. Do you like the idea of snowcapped mountains, but can’t make it to the Alps? May I suggest Mount Chimborazo. Home of one of the highest mountains in the world, Chimborazo province may be all you need to make your dream wedding come true. The province of Cotopaxi, home of Cotopaxi National Park, is named after the active volcano Cotopaxi. Not only are the views in this area amazing, but who can say they got married on the heels of a volcano? Cotopaxi is definitely a top contender for destination wedding locations. El Oro is one of the seven coastal provinces. The province itself is split into two sections, one is more mountainous and the other is more tropical. Having a hard time deciding between the tropics and the mountains? El Oro province has the best of both worlds. Esmeraldas is located in the northwestern corner of Ecuador. With over 20 of the most beautiful tropical beaches Ecuador has to offer, the only challenge here is choosing just one. 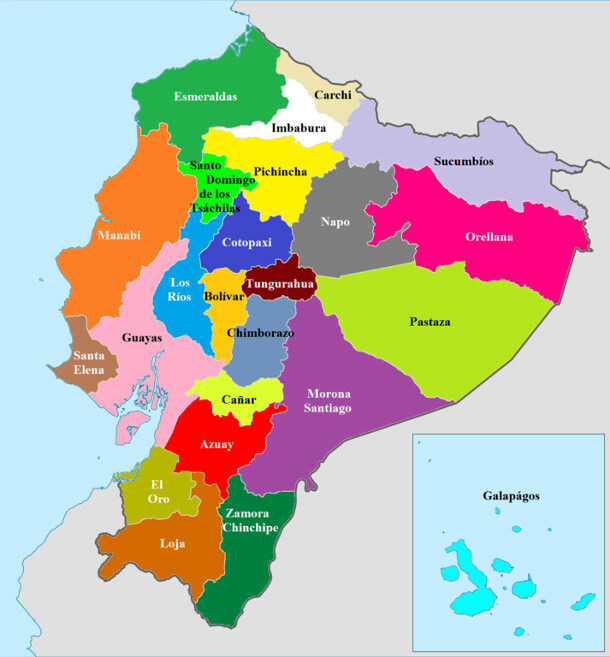 The Galápagos Province is located off the shore of Ecuador. The Galápagos Islands offer perfect weather, beautiful beaches, exotic animals and many adventures to enjoy. This is definitely a hot spot for destination weddings in Ecuador. Guayas is home to Ecuador’s largest city, Guayaquil. Whether you enjoy the city life or the calm beach life, you will have your choice with Guayas province. Imbabura is well known for the market held in Otavalo, an attraction many tourists visit every year. If you enjoy Ecuadorian culture, you'll enjoy the many sites Imbabura has to offer. A popular destination in the province of Loja is the Vilcabama Valley. Here you will find panoramic views of the Andes Mountains, a perfect backdrop to your destination wedding. Los Ríos is a coastal province. If you've always dreamed of a warm and tropical wedding, Los Ríos has what you need. Manabí province is located on the tip of the ocean. Manabí, best known for its abundance of white sand, palm trees and beautiful beaches is the perfect spot for your beach wedding. Morona-Santiago is located in La Sierra or the mountain region. Morona-Santiago is another great location to choose if you’ve always desired the mountains as a backdrop for your wedding. Napo is perfect for jungle lovers. Located on the eastern side of Ecuador, you’ll find plenty of green vegetation, wide rivers, an abundance of flowers, and warm, tropical weather. Orellana is located in the Amazon region. It provides you with direct access to the world’s largest rainforest. Pastaza, one of the largest provinces in Ecuador, is also located in the jungle. You’ll not be disappointed with this province as it offers great views, beautiful waterfalls and many adventures as you head into this jungle ridden province. Pichincha is home of Ecuador’s capital city, Quito. The great thing about this province is the easy access. Whether you want Quito’s historic Old Town or the stunning volcano as a backdrop for your wedding, Pichincha offers it all. Santa Elena is located almost entirely on the coast. Santa Elena is a perfect location for a beach wedding as it offers miles of excellent beaches to choose from. Santo Domingo de los Tsáchilas is a coastal province. Here you you’ll enjoy some of the beautiful natural surroundings Ecuador has to offer and enjoy some Ecuadorian culture as well. Sucumbíos is in the northeastern part of Ecuador. It is located on the Columbian border and makes up a large portion of the Amazon Jungle. At the heart of the Tungurahua province lies the city of Baños. Baños is one of the top tourist spots in Ecuador. With its beautiful waterfalls, access to an active volcano, and close proximity to the Amazon, it is the perfect location for an adventure-seeking couple. Zamora-Chinchipe, located in southeastern Ecuador is a place where the mountains meet the jungle. Are you having a hard time choosing between the jungle or the mountains? With the Zamora-Chinchipe province, you won’t have to make that choice. Find out more about getting married in Ecuador in our Ecuadorian Wedding Guide or visit our Ecuadorian Wedding Directory to start planning your dream wedding.